In the process, they learned what it takes to be safe while living on the street, how mental illness complicates efforts to get and sustain housing, where services and supports can be found, and how their neighbors respond with compassion. This was the first of three sessions hosted by the North Urban Human Services Alliance (NUHSA) to address the issue of homelessness in our community. 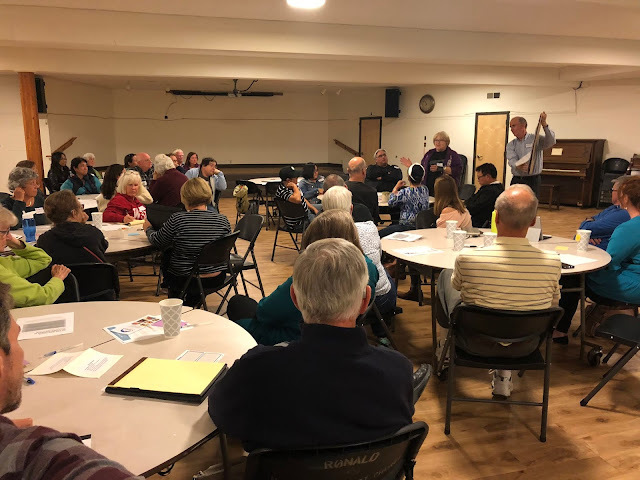 Gathered at Ronald United Methodist Church, this first session used a World Café model to create a space for conversation about personal experiences and interactions with those who struggle with homelessness, along with questions about how we respond individually and as a community. Coming away from the discussion, all were focused on understanding more about what they could do individually and as community to reduce the number of people living homeless. Or, join the conversation as the series is presented at Kenmore City Hall, 18120 68th Ave NE, 6:30 - 8pm, on October 2nd, 30th and December 11th. For more information, contact staff@nuhsa.org or see the NUHSA website. RSVP is appreciated but not required.